No drilling or dealer installation required! 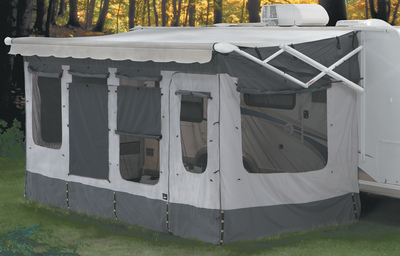 Designed to fit nearly all traditional and 12 Volt patio awnings with an 8' extension, there are no poles, rafters or permanent fasteners to attach to your coach. The Vacation'r is made of tough, lightweight material and its innovative design works seamlessly on awnings with a rain-dump feature. It's easy to carry, store and quick to set up. The insert can be left in the awning on 12V awnings. Multi-position privacy panels on the outside to help keep the rain out. Includes stakes, skirting and a convenient storage bag.